Seeing kangaroos in the wild is one of the most coveted wildlife experiences for visitors to Australia. Catch them at the right time of day—they tend to relax and graze around sunset—and it could be one of the most memorable scenes from your trip. 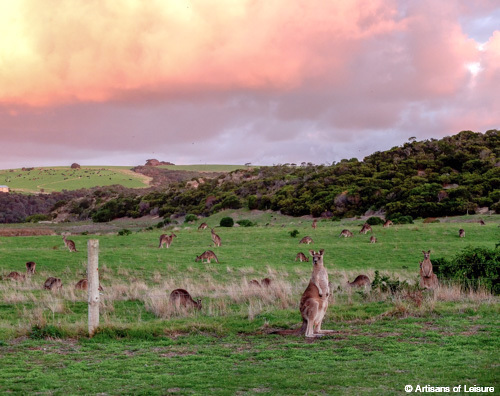 Though we took this photo in a rural area along the scenic Great Ocean Road outside Melbourne, it’s possible to encounter kangaroos all over the country. Artisans of Leisure can arrange wildlife-spotting activities, behind-the-scenes tours of renowned zoos and wildlife centers, and naturalist-led tours in the Outback and Australian bush to see kangaroos, koalas, wallabies, wombats, platypuses and other indigenous critters on our exclusive Australia tours.